TOUCH ONE, TOUCH ALL: Community Level Self-Defense Beyond DACA! The most aggressive base of trumpista fascism is anti-immigrant in general and anti-Mexican in particular. The white nationalists that hold power in this country see our people as a threat; not a political threat, but because they know they must contain our demographic growth. This is what is behind the recent decision by the Trump administration to end DACA, and also motivates Trump’s promise to surpass the Obama–era deportations in his first year in office – three million people – versus what Obama did in eight years. During this first year of Trump’s presidency it is the only promise that is moving forward as intended. To be clear, this goal was facilitated by a deportation machine that was originally created by the Obama administration. Furthermore, the elimination of DACA will be the bargaining chip for Trump to finance his apartheid border wall. 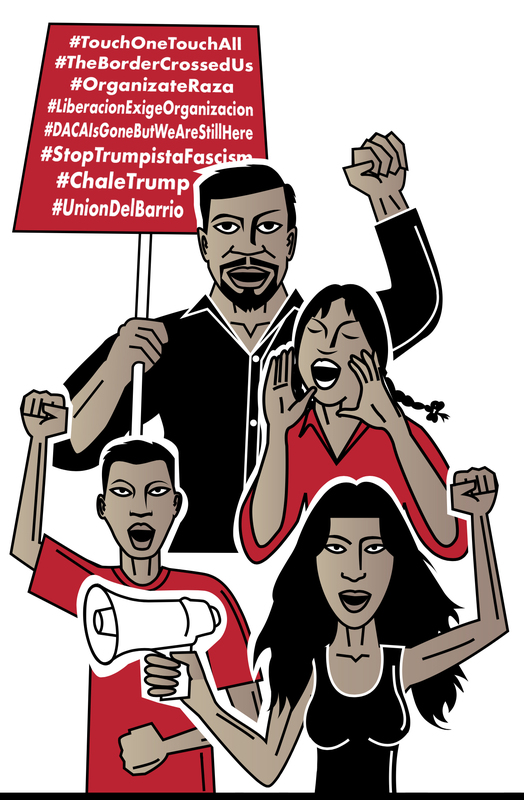 Unión del Barrio rejects the fascist threat that the elimination of this program represents. We call on the Mexican and Latin-American community, documented, undocumented, migrants, workers, students, youth, women, men, and gender non-conforming people from all sectors to organize and defend our people and build worker/community based power. Unión del Barrio invites our communities to build the necessary organizational capacity to respond and challenge this growing fascist threat that is every day more aggresively attacking our people. Join us to discuss what Community Level Self-Defense means, how we can respond collectively to the multiple threats that have been unleashed, and what to do next now that the end of DACA has been announced. September 14th, Maya Angelou High School. 300 E 53rd St, Los Angeles, CA 90011. 6:00 pm. September 27th, Santee Educational Complex. 1921 Maple Ave, Los Angeles, CA 90011. 6:00 pm. September 20th, Centro Aztlán Marco Anguiano. 2078 Logan Ave., San Diego CA 92113. 6:00 pm. This entry was posted in 2017, Analysis, Barrio Youth News & Events, Border Related News & Events, Davis CA News & Events, En Español, Event, Higher Education News & Events, K-12 News & Events, Local Community News & Events, Los Angeles News & Events, Organizational Updates, Police & Migra, San Diego News & Events, Self-Determination, Statement. Bookmark the permalink.